Fudo is a new sushi restaurant that opened in Chamblee in January. It is quickly becoming known for its high quality of ingredients and the chefs’ creativity when it comes to food presentation and combination of flavors. 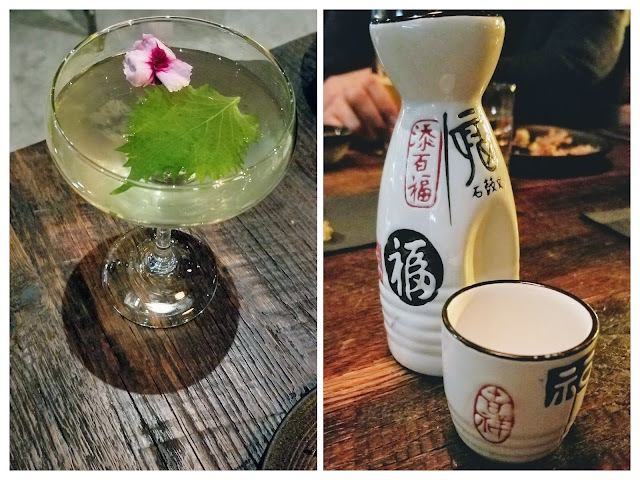 I had the pleasure of experiencing all of the above on a recent double date at Fudo with my friend Maryashley of Simply Maryashley. We grabbed our husbands (both named Michael!) and asked the chefs and bartenders to surprise us with their favorite dishes, which was an unforgettable experience! Read on to see what we ended up noshing on (including some secret menu items) and for some tips to help you plan your visit to Fudo. Because you appreciate sushi that is both fresh and imaginative. Fudo does both very well. Modern and cool, both in vibe and color scheme. Think dark wooden tables, concrete and metal details, a wrap-around sushi bar and a separate cocktail bar. Speaking of cocktails, do start your meal with a hand-crafted libation by one of Fudo’s bartenders. The Zen, the Toki-Yo, and the Mandarin Oriental cocktails are all great options to choose from. Or could simply ask the bartender to make you something yummy with your preferred liquor. Fudo has an extensive selection of sushi rolls, nigiri and sashimi options, as well as small plates, soups, salads, tempura, and rice bowls (donburi). Fudo’s menu is so impressive, it may seem overwhelming at first. Here are a few tips to help you narrow down your choices. Try the Brussels sprouts, cauliflower, and dynamite shrimp. The veggie dishes are served warm and are very flavorful, and you can never go wrong with some sweet and spicy shrimp, right? If you’re extra hungry, share the oyako-don with your group. This teriyaki chicken bowl is served with bok choy and lotus root chips over steamed rice. The Audi, Hunger Games, A Star Is Born, and Fantasy rolls are all excellent! If you’ve never had a hand roll before, do try one of the eight on the menu (pick the one with your favorite fish). They’re similar to regular sushi rolls ingredients-wise, but they usually have the seaweed on the outside and you eat them with your hands (no chopsticks required!). You won’t find a lot of sashimi/nigiri options on the regular menu at Fudo – they are mostly on the specials menu, as these options heavily depend on the kinds of fish the restaurant gets that day. These dishes tend to be incredibly creative and change often. Leaving the decision-making in the hands of talented chefs is one of my favorite ways to enjoy the best of what a restaurant has to offer. During this dining experience at Fudo, I did exactly that. I asked the chefs to bring out their favorite dishes of the evening, and they surpassed all expectations, including in terms of ingenuity, presentation, quality of ingredients, and service. If you’re feeling adventurous, I highly recommend this style of dining. And you can trust that your experience will be exceptional at this restaurant (Maryashley agrees). Fudo is located at 5070 Peachtree Boulevard in Chamblee’s Parkview on Peachtree. It is in the same area as Poke Bar and The Alden, and is catty-corner to Whole Foods. It is open daily for lunch and dinner and has plenty of free self-parking.